Is your mobile testing strategy good enough for the marketplace? With a funding round of $1.1bn (£850m) at a valuation of $45bn, Xiaomi was overwhelmingly the most valuable start-up in 2014. Shockingly, just 18 months since the last funding a new analysis indicated that Xiaomi’s worth fell down to a massive low of less than $4bn. This left everyone guessing. One of the key reasons identified was that the brand could not take a step further enough to perceive and effectively address market / consumer needs. This dipped its market share, which competition took away. IDC figures stated that Xiaomi saw its smartphone sales drop by almost 40% in China during Q2 of 2016 as compared to the corresponding quarter in 2015. Ironically, the overall Chinese market grew by almost 4.6% during this period. Report suggests that Xiaomi’s share got eaten up by players like Huawei, Oppo, and Vivo, who saw some soaring growth numbers. Keeping secrets in the tech world could be a task, but standing by your brand’s claims and proving that the speculated compelling features are good to be true is every tech brand’s dream. Great features and greater surprises. Apple/Iphone launches have it all! Prelude for an Iphone launch marks an exciting journey for the global media as well as tech enthusiasts. It brings us a series of stories and guess works full of exciting speculations. The recent Iphone7 launch has been no different. Iphone7 brought to its global fans as well as naysayers a distinct surprise by removing the headphone jack. As expected, made the Apple statement loud and clear. Whether it is breaking the clutter or making a distinct statement, what makes a brand stand confident in the marketplace? It is the unbeatable claim of the brand to offer its customers a robust system. For instance, Nokia continued to be a trusted name for its loyal customer base even post the Microsoft acquisition. However, lagged in terms of rapidly evolving customer expectations. Steady…Sturdy…but sleek…How can your mobile device have it all? The next question in line: Is your device tested enough to be trusted? Gartner report states that in 2013 a revenue of about $26 billion dollars was generated from 102 billion mobile app downloads in 2013, and it is expected that by 2017 over 268 billion downloads per year. 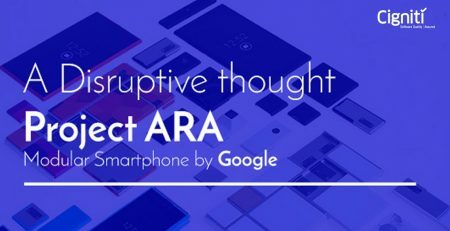 Interaction of the applications with the device will define the ultimate experience for the customer. This definitely validates the need to stay alert and stay prepared for an ever-demanding market and ever-pressing competition. Mobile Device Testing and Mobile App testing is tricky and has to play by market rules and changing dynamics. Testers are challenged by various Operating Systems (OS) and equally across various versions of the OS, multiple devices, screen dimensions of all shapes and sizes, various carriers and combinations of data bandwidths offering various speed limits/capacities. With the rising popularity and need for mobile testing, there are endless number of testing tools made available in the market, each one with an enhanced feature and capability to consider. There is a dramatic rise in the number of devices in the market, across various price ranges. So, when it comes to Mobile device testing, the key challenge is to decide on the right device in a given time frame. Whether it is automated or manual testing, deciding on the mobile device for testing is the first step to get it right! With a universe of devices and platforms in the marketplace, it is more than inevitable to produce a bug-free application within stringent timelines and at the same time consider every minute spec. Whether it is Appium for Native apps or Selenium for Web apps, collaborating with the right testing partner with the required expertise is your key to success and better RoI. Native applications run on a specific mobile device hardware, which can operate with or without a data connection, namely, Kindle or any gaming applications. These applications might work without data connectivity, however, they might also invariably require data connection. They are structured to operate across all platforms with the same basic code, and are apps that need not be typically on an App store, but merely a web application. Hybrid apps are applications that are available on an App store and are specifically designed for the Mobile devices. However, they depend and can require a connection with a website or a web-based database (like API) to function and give the necessary outcome. Prominent example is the Wikipedia app that needs an active connection with Wikipedia.org, or a NetBanking application that needs connectivity to the Web application. In situations and scenarios like these, testing the device for a bug-free and secure user interface is a much needed investment. It empowers you to take a definite leap and innovate by industry standards. Irrespective of the OS, it is important to understand and improve every application’s functionality across devices and its interoperability with the other factors, namely, Data consumption, battery consumption, and overall UI/UX. Smartphones with their touch screen features have redefined user experience. All started with the iPhone, where not just the hardware but even the well-integrated GUI worked for the device. Testing helps you ensure the application’s responsiveness and the right set of reflexes on the device. Is this the way the application has to work? How will the user respond to it? What if there is distortion in the data connectivity? Incidentally, the challenges faced by Mobile App testers are similar to the challenges faced by Web/Desktop App testers. So, a similar set of testing tools can be considered, with additional tools like emulators to cover a larger spectrum of devices. While Emulators work for user interface testing and quality assurance at the early stage, using real devices helps in performance testing. Industry experts suggest using emulators to make the process cost-effective, however, another school of thought promotes using the actual devices for real-time results. 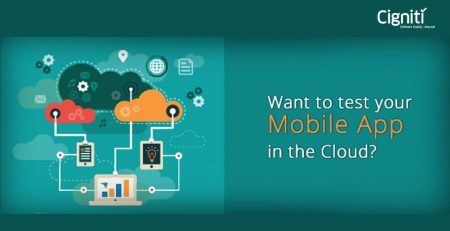 Setting up a Cloud Testing environment enables you with a mobile set-up that is available anytime and 24*7. A Device Cloud is hosted on-premise and rents out devices for testing mobile apps on requirement basis. These Cloud providers have access to the latest mobile devices and can offer a great deal of advantage for brands who wish to test their applications on the latest enterprise mobile devices. Emulated Device clouds also help test scalability of the device to handle many simultaneous requests. Additionally, Device clouds with physical hardware offer further inputs on various interconnected factors in the overall functioning. All in all, the set of challenges in Mobile Testing are massive and are getting redefined every hour. The trick is to test various patterns and choose the best combination suitable for your market needs. Agile Testing is a sure winner, as it takes a grab of the situation at every stage and if required, redefines the strategy for better results. Choosing a right testing partner with the required strategy diminishes your challenges and helps you go the extra mile and sustain in the marketplace. Cigniti’s cloud-enabled Mobile Device Test Lab offers access to over 600+ latest devices. The lab is equipped with a diverse set of devices that cover various Operating Systems (iOS, Android, Windows and Blackberry) and Smartphone brands (Apple, Samsung, LG, Motorola, Lenovo, HTC, etc.) Connect with us for a strategy that gets you ready and sustain well in the marketplace. 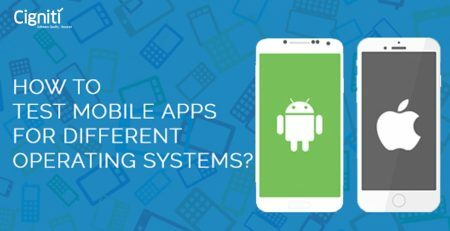 How to Test Mobile Apps for different operating systems ?